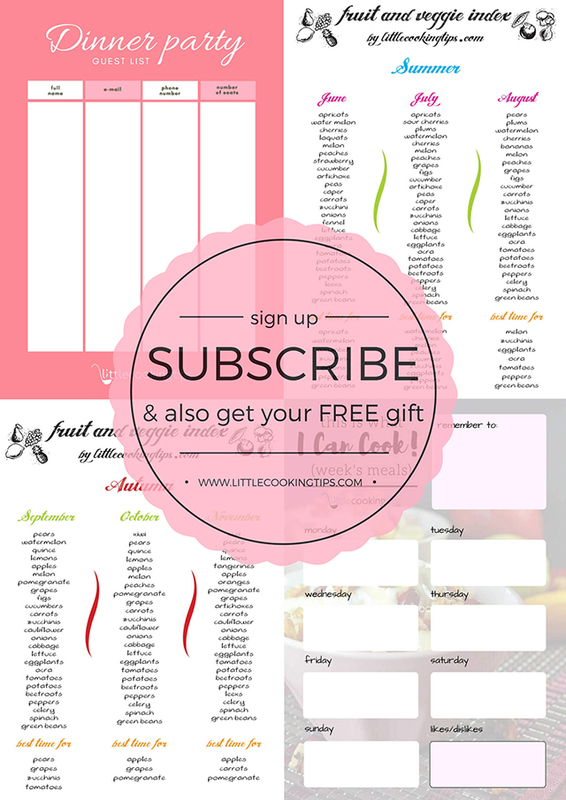 ﻿ Sign Up and get Free Printables for your Kitchen - Download now! A token of appreciation with each newsletter sign-up! We are so excited to announce this new feature on the blog! You see, we have always wanted to share something useful with all of you who sign up for our newsletter. So, we had a little "blog meeting" between us two and started coming up with ideas. The most obvious choice would be to give you an ebook / binder with recipes. Since those are already shared on the blog though, and you can already print them if you like (check the "Print it!" button at the bottom of each recipe), it seemed pointless. Then we thought this simple thing: what do we print ourselves in some cases, that is useful and helps us around the kitchen? Well, besides new recipes to try out, we print a guest list, when we have a lot of people over. So that's one thing we could share. What else do we print? A week's menu, to organize our cooking and shopping and save time! So that also checked out as a great printout for a lot of busy people. But only these two things? Would that be enough? And then, looking at a basket with fruits on our counter top it struck us: Seasonal fruits and veggies! Nowadays, one can find almost any type of fruit or vegetable at large super markets. This doesn't mean that this fruit or vegetable has grown naturally though, out in the open field. Nor that it has the smell, the flavor that it should have. That's the main reason (and also the fact that we were raised this way) that we try to buy and cook only in-season vegetables and fruits, ourselves. In addition to that, it wasn't rare to receive an email or a message in social media, in which people were asking us the same thing: "Should I use tomatoes in November?" - when looking at the Horiatiki Greek Salad , "When is the best season to buy zucchini?" - when reading the Greek Zucchini Fritters. So, we collected a large variety of popular vegetables and fruits, organized them by Season and added suggestions for each month as well! Next, we packed all these printables into a zip file, and first, sent it to our newsletter list. Some of the comments we got as a response were very flattering (thank you so much for this!). Therefore we went ahead and added this PDF package for all the new subscribers! If you want to sign up for our newsletter, type your email address and hit subscribe in the form below. As a token of appreciation, you will get your own free copy of printables! We think you'll find it as useful as we do and keep printing these out in the years to come, to make things easier. If you print any of these and you do find it useful, please share your photos with us on our twitter feed (@LittleCookingT) ! We'd love to see you using it!